Hallyu star Park Shin Hye was recently invited to guest star on Chinese TV show "Up everyday" (천천향상). 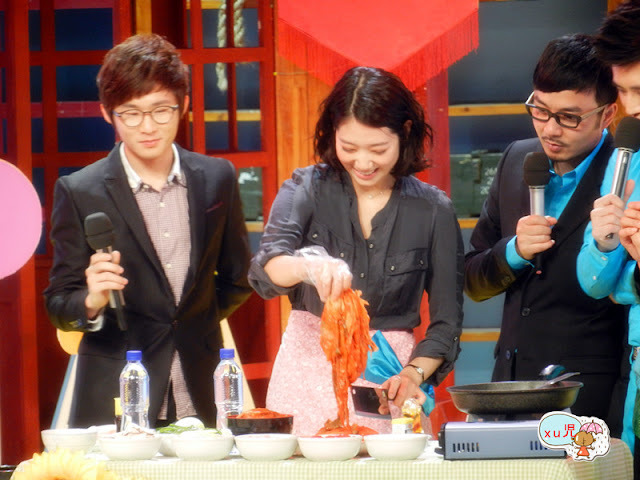 This marks the 1st appearance of Park Shin Hye on Chinese variety TV show programs. The actress did a lot of prep work before landing in China, including practicing diligently for her singing and dance performances, and also brought cooking ingredients from Korea for her cooking skill performance. Park Shin Hye has gained immense popularity from her drama 'You're Beautiful" (미남이시네요), which has earned her a lot of Chinese fans and an invitation from TV Show "Up Everyday". When we asked her about her feelings before the TV show's filming, Park Shin Hye said: "This is my 1st time to perform in front of such a large Chinese audience. I am really nervous." Park Shin Hye: "I am not a 'meteor'. I am here to stay." When asked whether Park Shin Hye knows about drama 'You're Beautiful' (미남이시네요)'s popularity in China, the actress answered: "After 'You're Beautiful' was broadcast in Korea, I read online that many Chinese fans love and support the drama"
Debuted at the young age of 13 in drama 'Stairway to Heaven'(천국의 계단), Park Shin Hye is one of the Korean stars leading the Hallyu wave. For many child stars in Korea, fame is short-lived. What does Park Shin Hye feel about this? "I am not worried about being a temporary star," she answered, "I started filming when I was very young, so I don't have a lot of freedom." In school, she is the icon of attention. "Whatever I do in school will be tracked down by netizens and uploaded to the internet via SNS." "If one day nobody could recognize me, I might have my own freedom," Park Shin Hye said in deep thought. On the day of TV show filming, there were some other groups of guests who were in a rush to catch their flights. As a result, Park Shin Hye was scheduled to be the last filming guest for the day. 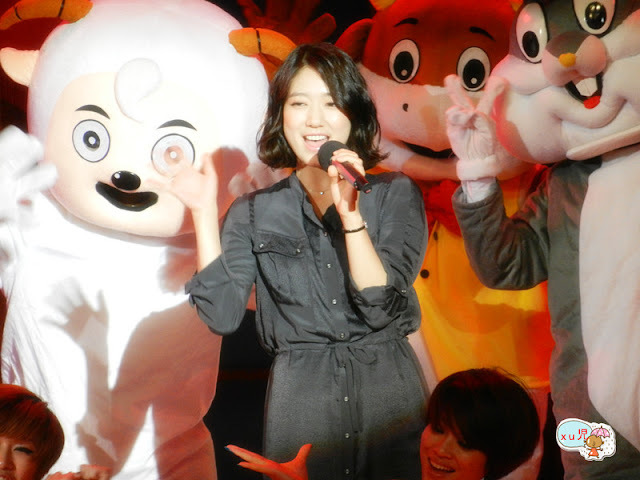 After 5 hours of rehearsals, interviews and waiting, Park Shin Hye finally went on stage. Despite being young (22), Park Shin Hye performed professionally to the Korean celebrity standards. She co-operated with others very well on various parts of filming. The actress sang her hit songs 'Without Words'(말도 없이) and 'To Love Me'(사랑하게 되는 날) and danced to Beyonce's 'Single Ladies'. After that, she cooked kimchi soup and kimchi pancakes. She brought the kimchi ingredients specially from Korea herself. Korean dramas are very popular in China. Has Shin Hye thought about debuting in China? "Many of my Korean celebrity sanbaes are participating in Chinese filming projects. If I have the chance one day, I hope that I can do so too." However, Park Shin Hye has already signed with Japanese agency IMX recently, "I will be focusing on activities in Japan. So for the near future, I have no plans of debuting in China." "My favourite Chinese idols are F4 and Jay Chou"
Park Shin Hye shyly says that her favourite Chinese idols are Taiwanese F4 and singer Jay Chou. "The boys in Taiwanese version of F4 are very handsome, I like all of them." Although Park Shin Hye can say simple phrases in Chinese such as 'I love you', 'Thank you' and 'My Friend', she cannot converse or sing in Chinese. However, she said she is a fan of singer Jay Chou. "I watched his piano performance in movie 'Secret'《말할 수 없는 비밀》. He's very charismatic. I have an OST of that movie." Korean drama 'You're Beautiful' will begin broadcast in China on Dec 12 2011. A Chinese remake version of the drama series is also scheduled to be filmed in 2012. Really looking forward to the Chinese remake of YB..